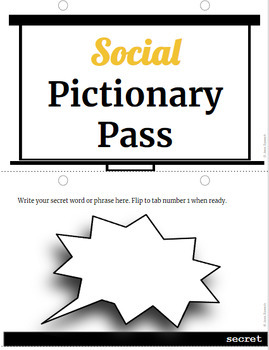 Social Pictionary Pass is a social party game that plays like Pictionary and Telephone combined! 3-10 players can play! 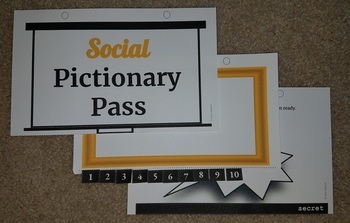 Basic gameplay: Each player receives a Pictionary Pass Booklet and selects a secret word or phrase from a drawbag. Players write the secret word on the last page, then have 1 minute to draw a picture of their secret word. Times up- all players pass their booklets to the player to their left. 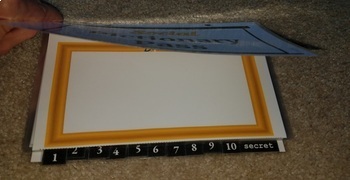 Players now have 30 seconds to examine the picture and write down what they think the secret word could be. Players continue to draw & pass/write & pass, until the booklets return to their original players. Players now take turns sharing the hilarious drawings and reveal the true secret words. Opportunities for social skills discussion will arise as students navigate playing the game, and reveal secret words/phrases that are related to social skills. This game will be absolutely FULL of laughter! Your students won't even know they're working on social skills :). -A total of 360 Pictionary cards with social skills mixed in at 3 levels (120 cards each): Easy, Medium, & Hard. 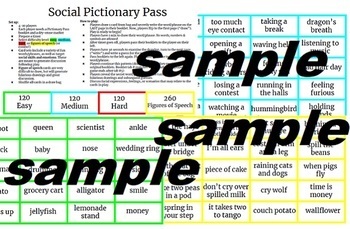 -A total of 260 FIGURES OF SPEECH cards! These are hilarious to draw ("when pigs fly," "I'm all ears," etc. ), and awesome for discussion!